Yes, the decision was unanimous. Sir Nigel Gresley would be depicted quizzically surveying the new Western concourse at King’s Cross, with the Art Deco-esque lines of the new balcony and the incredible new ‘tree’ canopy. Sir Nigel was quite a showman, so this seemed the perfect stage-set for him, with his old office building – now a Grade I listed building – as the perfect backdrop. With his back to the old, he would be looking out towards the new, towards today’s busy commuters traveling near and far on trains influenced by his feats of engineering. 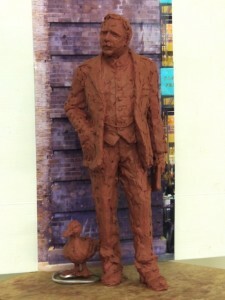 The go-ahead was given and I started to sculpt this pose in clay, as the final maquette (35cm), for casting in bronze.